You really can’t go wrong when you combine potatoes, ricotta, gruyere, leeks and pancetta. These individual size portions are made in a muffin tin for easy serving, creating a great holiday buffet dish or an appetizer for a cocktail party! With the coldest February on record here in Chicago finally over, thoughts are turning to Spring…I know we should not get ahead of ourselves just yet….so anything that conjures up thoughts of spring is extremely welcome! This dish makes me think of Easter…..these individual potato gratins with creamy cheese, some sautéed leeks and crispy pancetta baked to a nice crisp golden brown. Yum!! Pancetta and leeks are actually two of my favorite ingredients. I love the way pancetta adds a nice salty crunch to a dish without being too greasy. Leeks are great when you want to add a milder, slightly sweeter flavor than an onion to a dish. I enjoy coming up with yummy concoctions to use them together! In order to get them to cook properly, the potatoes need to be sliced really thin, so I’d recommend using a mandoline. This will ensure you get the right thickness and that all the slices are consistent. Definitely wait until right before you are ready to assemble the gratins to slice the potatoes; I pretty much put them into the muffin tin right after I slice them. When I first created this recipe it was one large potato gratin in a casserole dish but since I love recipes that create individual servings I decided to revamp it by using the muffin tin to create smaller portions that get nice and crispy on the edges. Who loves crispy, cheesy potatoes? Creating individual servings also makes it really easy to portion out and if you are serving a crowd it can help with planning, as you can count on 1-2 portions per person. And I just think they are really fun too!! These mini potato gratins have so many possibilities when it comes to serving. You can use them as a side dish at a sit-down holiday dinner – instant portion control! They also make a great addition to a buffet be it a holiday dinner buffet or a cocktail party spread. However you decide to serve them they are sure to get rave reviews from your guests!! And if you want to indulge all by yourself, serve them with a nice green salad and a glass of wine for a tasty light meal. I may have eaten about half of them in one sitting before! If you love leeks and pancetta together, check out my Quiche with Leeks & Pancetta that also combines both of them for a perfect brunch dish! Or if you are looking for other unique potato recipes check out these tasty Smashed Potatoes with Sage Sauce. OXO V-Blade Mandoline – I like this mandoline because it is reasonably priced and lets you control the thickness of the slices with the turn of a dial. It also comes with several different blades so you can also julienne veggies too. Comes apart easily for cleaning and then locks for storing. You really can’t go wrong when you combine potatoes, ricotta, gruyere, leeks and pancetta. These individual size portions made in a muffin tin for easy serving, creating a great holiday buffet side dish or a fun appetizer for a cocktail party! Preheat oven to 350°F. Coat a standard size 12 cup muffin pan with cooking spray. Heat a medium skillet over medium-low heat. Add the pancetta and cook for 8-10 minutes, stirring occasionally until crisp. Remove from pan and place on a plate lined with paper towels to drain. Return pan to heat; add butter and melt. Add leeks and cook for 2 minutes or until soft. Set aside to cool. In a medium bowl combine the ricotta, 2oz gruyere, greek yogurt, cream, thyme and pepper. Mix well. Add leeks and pancetta. Stir until combined. 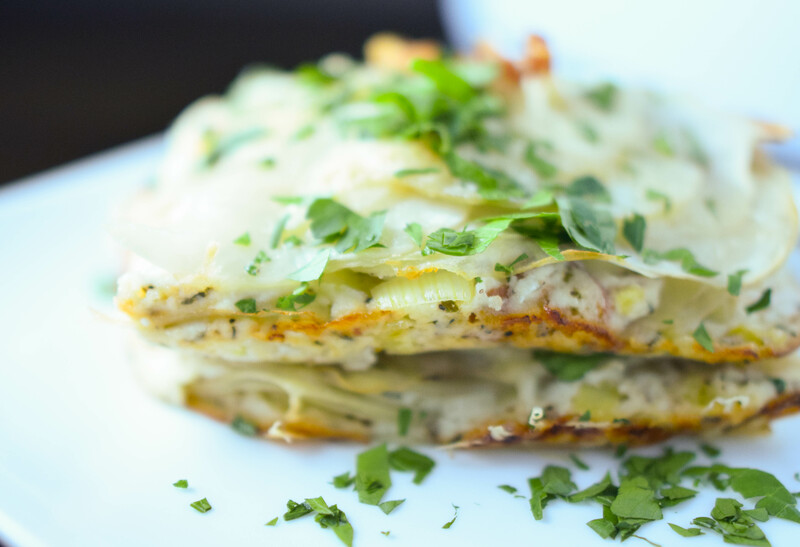 Using a mandoline, slice the potatoes into 3/16″ thick slices. Add a slice of potato to each of the muffin cups. Top with about a tablespoon of the cheese mixture. Repeat with a second layer. Top the second layer with a slice of potato and sprinkle with remaining gruyere. Bake for 40 minutes or until golden brown and edges are crispy. Turn the oven up to 450°F and cook for an additional 5 minutes. Remove from oven and let cook for 5 minutes. If you happen to have leftovers they will keep in the refrigerator for a day or two. They are best reheated in a standard oven or toaster oven so they get somewhat crispy again. Updated. Originally posted February 2015. I love a gratin. I can just imagine how good yours will be with pancetta. These look beautiful, I love anything with pancetta…and Ricotta!! YUM! Thanks for sharing! I’d love this as a lunch with a salad! Gratins are my favorite side or light main dish. So comforting. Everyone I love in one dish! Potatoes au Gratin are one of my favorite decadent dishes. I love your version with leeks and pancetta. I loved the idea of making them in muffin tray. What a neat way to make individual portions, especially for a party! I like the idea of getting the potatoes a little crispier in the muffin cups as opposed to one large casserole dish. I plan to try this out for Thanksgiving. Crispy potatoes are always the best! Enjoy! !